I share quite a few ideas here on my blog, but I hardly ever post a follow-up and you probably assume my ideas always work out. Remember Daniel's bunk bed shelf? He didn't like it. He said he felt like it was going to fall on him and then when he tried to push it further along the rail it broke. I never fixed it (what's the point if he doesn't like it?) So that idea was a bust. And then remember the summer holiday schedule clock? Well, the battery in the clock died right after I made the little icons and I never got around to replacing it. Well, I asked Grant to replace it because he has an elaborate system of batteries that are charged, batteries that are waiting to be charged and batteries that are supposed-to-be-charged-but-act-like-they-are-flat. I can never find a working battery so that's why I never bothered to do it myself. Grant never got around to it so we never actually used the clock! But The House Game ... The House Game actually works!! I know, I was shocked too. Especially since it involves making my children work. Ah, work ... it's a whole other post I've been meaning to do (along with answering your organising questions, which I haven't forgotten about.) Work isn't just something that is necessary, it is something that is so important for our self-esteem, minds and bodies. But like I said, that's another post. My point is, I wanted to get my kids working around the house more, and this is what I came up with. Okay, well, not at first - to start with, it was just a numbered list scribbled on a piece of paper. It still worked. On the list (or printed, cut out and stuck onto this patterned paper in a frame) are 12 numbers. My goal is to keep them moving. As I make the bed in my bedroom I visually scan the room and give them jobs to do (replace shoes in the wardrobe, bring me pillows off the floor, open the curtains, etc) until the room is done. As I unload the dishwasher in the kitchen they are clearing the table and wiping it, putting away snacks, straightening the chairs. As I fold the blankets in the lounge they are putting the remote controls where they belong, straightening the cushions on the couch, picking up toys. When we are busy downstairs we have a plastic tub into which we throw all toys and things that belong upstairs, and then when we are done we take the tub up and put the things away. When we do laundry it means that I am folding clean laundry and sending them off to put things away, or they fill a plastic tub with dirty laundry and take it to the cellar and put a load on to wash (Daniel can do this by himself, Noah helps him). They enjoy it because it's fair (we are all working together, nobody is slacking off) and because it's not overwhelming (one room, one mini task in that room at a time) and they don't have to think, just do the little tasks I give them. They don't have time to stop and think, get bored or protest. When I decide that we will play The House Game it is non-negotiable - but I usually let them know what will happen when we are finished (they can have a treat, we can go out, they can do a craft, etc). It's amazing how quickly the house gets picked up and how good the boys feel about themselves afterwards! I've only played this game with them with tidying, not so much cleaning (dusting, polishing, wiping, except in the kitchen), but that will follow. So I just wanted to share this little game that works for us! I'm excited to try the framed version - I plan to use a dry-wipe marker to cross off each room as we do them. 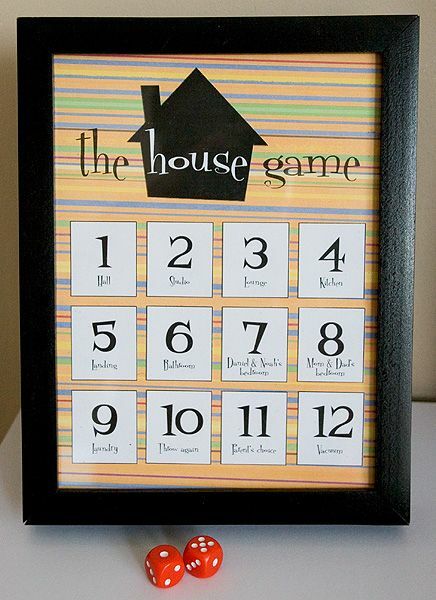 If you try The House Game with your family please let me know how it goes! [UPDATE] Due to popular demand, here are the downloadable files. If you want yours to look like mine, print it twice - once on patterned paper and once on white paper. Cut out the house from the white paper and stick it over the house on the coloured paper, so the word "house" shows up in white. Do the same for the blocks. Then write in your room options. Or just print it on white if you aren't bothered about the pattern, then write in your room options. There are tick marks to show you where to trim when cutting it out. The finished size is 6x8 inches and will fit into a standard 6x8 inch frame. Use a dry-erase marker to cross off the rooms on the glass front of the frame as you clean them. hugs and kisses all round!